Giveaway: Official Bear Grylls Survival Bracelet from Gerber! Renowned British explorer and survivalist Bear Grylls is back with the ultimate survival competition, Get Out Alive! SEASON FINALE on Monday, August 26 9/8c on NBC! With this amazing GET OUT ALIVE app, you can watch action-packed and hilarious GIFs from the show, take the WOULD YOU GET OUT ALIVE? quiz, and get to know the contestants by watching inspiring videos about how they have all overcome huge obstacles in life. 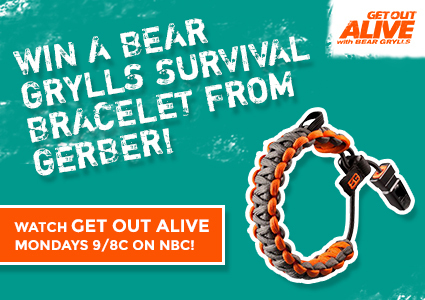 Win a Official Bear Grylls Survival Bracelet from Gerber! Taking advantage of Gerber’s decades of experience and Bear Grylls’ adventure knowledge, this survival bracelet’s design provides 12 feet of high-strength paracord to help you work your way out of a difficult situation. Weighing less than an ounce, it has an easy, one-hand size adjustment and an integrated whistle. Open To U.S Residents The prize will be sent via FedEx or USPS. No P.O. Boxes please.